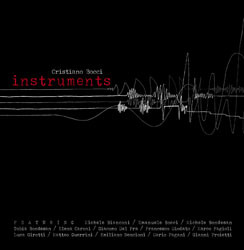 I first experienced Cristiano's clear thinking, infused with a healthy sense of humour, by listening to him talking about electronic music in a seminar. Complex, involved matters were simplified into their key components, like one does separating movement into vectors or sounds into harmonics: a mathematic mind at work around music making. Listening to this CD's music gave me the same feeling. A feeling of probing into music itself, into the different level shapes – phrasing, timbres, polyphonic weavings, in the uneasy area that brings the listener to “think” about what one “hears”. A sense of fun, from the name of the work itself, a totally “virtual” recording dedicated to what is markedly absent, and yet continuously evocated, i.e. acoustic instruments. And finally the sheer joy and pleasure of creating melodies and giving them bodies, then moving them into time and space. Research, experiment, art and fun are close cognates and do not survive without each other – this music is an excellent reminder of it.